Building on their popular Black Friday promotional set, 2015 Panini Cyber Monday continues the season of sales with a more limited offering specifically for case breakers. While the special packs are limited to case breakers and obtained by purchasing select products, it is safe to assume that many of the packs and cards will make their way online. Pre-orders begin on November 16 are expected to quickly sell out. The actual packs will be delivered on Cyber Monday (11/30) to those breakers that qualify . 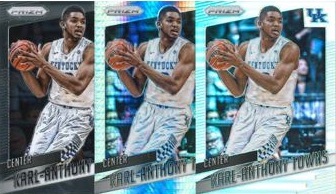 Among the card options, a 14-card Prizm Rookie set is the base option and parallel versions are numbered to 25 and 10. 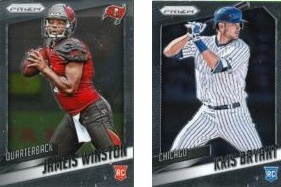 The set includes key first-year players from the NFL, NBA and MLB. Featuring the more premium choices, there are Autographs for NBA rookies like Jahlil Okafor, Karl-Anthony Towns and D’Angelo Russell. Also, Memorabilia options include relics for the top 2015 rookies across the three sports. Lastly, there are special Cyber Monday stamped cards from previous sets that are numbered to just seven copies. 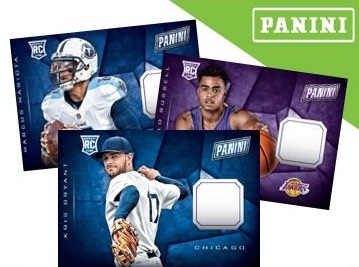 Check back as more information is revealed for Panini Cyber Monday. Kristaps Porzingis RC Auto 2016 Panini Black Friday Packs SP Auto!